Games have definitely changed over time. 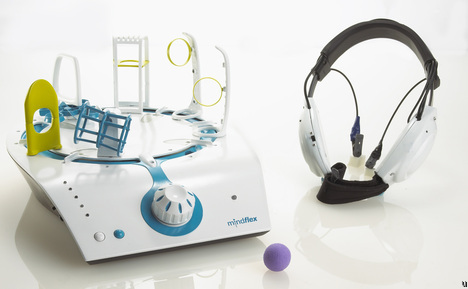 Even from just ten years back, most would never imagine something like the MindFlex game by Mattel. The game looks more like something you would see in a lab to test for some psychic ability. In reality though, it’s just a toy for kids ages eight and up. Although I give it a week after this comes out that some kid gets his pet rat stuck in the obstacle course. That or their brother will, because everyone knows it’s always the brothers that are the evil ones, never sisters. In order to get the ball through the obstacle course, you need to be wearing the headset which is full of sensors. The headset then measures your brainwave activity. Using mental concentration, the gamer guides the ball through the obstacle course which is customizable. Of course I’m sure a great deal of people will be suspicious as to how well a product like this would work and understandably so. I imagine it’s just one of those things you’d have to give it a try to find out. It will be available this fall for $79.99. At that price, hopefully it won’t end up being one of those games your kids play twice then bury at the bottom of their closet.